The first annual Lizardman Festival and Comic Con was held June 8-10 at the S.C. Cotton Museum in Bishopville. Posters were designed by Gregbo Watson. Lizard Man documentarians Lyle Blackburn and Cindy Lee. Lee County Chamber of Commerce Executive Director Lanette Hayes sports a classic Lizard Man design by Robert Howell. Some visitors came in costume, including the Kilted Creature, a bagpipist that dedicates his work to the Creature from the Black Lagoon. That’s the story 17-year-old Christopher Davis reported to the Lee County Sheriff’s Department in 1988. Many sightings of Lizard Man followed, often involving the destruction of vehicles, and whether or not Lizard Man was real, tales of the creature left a permanent mark on the small, agricultural town of Bishopville. Howell is an artist known for his illustrations of Lizard Man, which have been sported on countless t-shirts over the years. Howell’s designs are so famous that they made it into the official Lizard Man historical exhibit at the South Carolina Cotton Museum in town, alongside items like castings of three-toed footprints rumored to belong to Lizard Man, and a sign from the butterbean shed where Davis claimed the cryptid showed himself. Howell with one of his designs. This is where I spoke to Howell last weekend, during the first ever Lizard Man Festival and Comic Con. He was one of dozens of vendors and speakers, ranging from local artisans to high-profile cryptozoologists and ghost hunters. The event comes at a time when Bishopville is pushing to build its tourism industry to encourage a needed economic boost after several difficult years for agriculturists. That’s why Eddie Grant, the Cotton Museum’s Executive Director, was thrilled to play host. While the Cotton Museum is an attraction in its own right, Grant said their Lizard Man exhibit is always a considerable draw. “We have people here from Texas, Oklahoma, North Carolina, New Jersey. People are just fascinated by it. We actually had a film crew from Japan come in not long ago, just to interview and take pictures and do a documentary on the Lizard Man,” said Grant. Festival planner John Stamey also had tourism on his mind. “My model for this is the Mothman Festival in Point Pleasant, W.Va,” he said. “According to the Chamber of Commerce in Point Pleasant, they say the Mothman Festival is the largest economic driver between Pittsburgh and Charleston, W.Va. I hope Lizard Man Festival can do that, and bring a lot of economic activity not only to Bishopville, but the whole area,” he said. For Stamey, Lizard Man isn’t just a staple of Lee County culture; he believes that Davis really saw something out of the ordinary that night in 1988. Leading Lizard Man documentarian Lyle Blackburn took a slightly different stance. “As far as this case goes, I think it was very much concentrated in a certain time period, and then whatever it was, or whomever it was . . . moved on or disappeared,” he said. Blackburn authored the 2013 book “Lizard Man: the True Story of the Bishopville Monster,” and clocked countless hours of research on the subject with his research partner Cindy Lee, even gaining access to files belonging to former sheriff Liston Truesdale, who treated reports of a Lizard Man with as much care as any other investigation. He’s the closest thing to an expert on the elusive cryptid, so for many people, his assessment carries weight. If one were going to see the Lizard Man, it would probably be at Scape Ore Swamp, where some believe he still lives today. 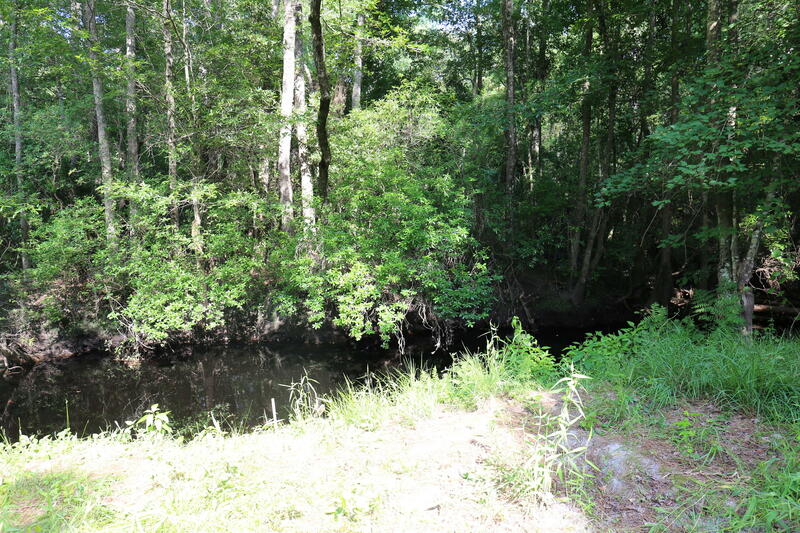 During the festival, Blackburn led a group to the area where one of the most high-profile sightings allegedly occurred, near a natural artesian well by the swamp. The spot used to be easily accessible, but in 2018 we had to jump a guardrail in traffic to find the place where a local cyclist stopped to drink from the well and have a smoke and saw a large humanoid creature from across the street. That was in 1987, a year before Davis’ story encouraged others to come forward with their own cryptid sightings. As Blackburn predicted, we didn’t catch a glimpse of anything big, green and scaly at the swamp last weekend, though it wasn’t hard to imagine something or someone emerging from the thick trees (Blackburn said these woods used to be a haven for moonshiners—Sheriff Truesdale supposedly got stuck in quicksand once while pursuing moonshiners near here). But the dedicated Lizardman fans that came on the swamp tour just seemed excited to be there. For instance, Dr. Joseph Laycock, who travelled all the way from Austin, TX, where he’s a professor of Religious Studies at Texas State University. Laycock is a big fan of cryptid festivals, and has attended the popular Mothman Festival a number of times in the past, but he says the Lizardman myth is one he considers especially notable. While his profession might make Laycock seem an unlikely candidate for cryptid fandom, he feels differently. It’s true that news of Lizard Man sightings, which continue throughout the years with varying levels of credibility, are a popular point of humor in the media; S.C. native and late night host Stephen Colbert even focused a whole segment on a dubious photo purported to feature Lizard Man in 2015, and included his own claim that Lizard Man was responsible for ruining his Charleston-procured rental car (according to Eddie Grant, that’s a common excuse in Lee County, especially among teenagers). Laycock added just one caveat.